There is no doubt about it, eels are simply fascinating. They come in a wide variety of shapes and colors and easily captivate all who come in contact with them. Unfortunately, eels are notoriously hard to care for and often do poorly in home aquariums if the proper steps are not taken to ensure their proper care and environment. 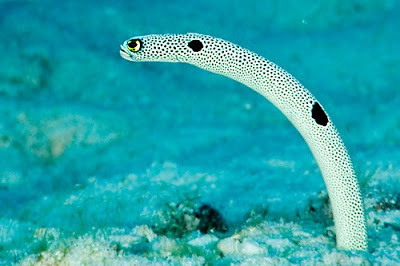 In general, there are two main families of eels that are readily available for purchase: The Muraenidae family (including eels such as the Tessalata, Wolf, Snowflake, and Zebra Moray Eel) and the Congridae family known as Garden Eels (including Spotted Garden Eels and Splendid Garden Eels). In this article we will take a quick look at both families of eels and discuss the main considerations for their care. There are approximately 200 species in the family Muraenidae, but only 12 species are suitable for the home aquarium. To further complicate matters, only 5 of those 12 species are deemed safe to be in captivity with other fish. The most popular of these eels are the Snowflake Eel (Echidna nebulosa) and the Zebra Moray (Gymnomuraena zebra). These eels typically grow to a length of 30″-36″ and require at least 40 gallons of water to thrive. These eels are typically referred to as “pebble-toothed eels” due to their blunt molar like teeth that are used for crushing the shells of their prey. These “pebble-toothed eels” feed primarily on hard-shelled invertebrates and crustaceans and typically make for good aquarium inhabitants. The second group of eels is known as “fang-toothed eels.” These eels include Dragon Eels, Green Moray, Jeweled Moray and Golden Moray. Unlike the “pebble-toothed eels”, the “fang-toothed” eels have many sharp teeth designed not to crush, but to tear and rip apart prey. Many people are attracted to these “exotic” eels, but they are very difficult to keep in home aquariums. When dealing with the “fang-toothed” eels, it is imperative that you are very careful when working in your aquarium, especially if their is food in the water. If bitten, it is almost impossible to remove the eel without killing it and even then, it’s specialized jaws will remain latched to your arm and will need to be manually pried off. They also grow quite large and will become more aggressive if they are not provided with a large enough aquarium in which to reside. They do not do well with other inhabitants, especially if the environment is not sufficiently large. The “fang-toothed” eels really should only be kept in a species-specific aquarium and cared for by very dedicated, knowledgeable aquarist. Moray Eels, like the Octopus, are known escape artists. The last thing you want to do is come home and find an eel flopping about on your floor. If you are going to keep an eel, make sure your aquarium is equipped with a lid and that it can be secured. An adult Moray Eels can grow to a length of 30 – 36″ so it is very important that your aquarium is large enough to accommodate growth. While some sellers will tell you that 40 gallons is sufficient, many experts recommend at least 75 gallons. An aquarium smaller than 75 gallons, really does not give you enough room to create a natural habitat for the eel nor does it give room for the other aquarium inhabitants to feel like they have some “breathing room.” Eels typically spend their time hiding in holes or crevices with only their heads visible. When aquascaping your aquarium for a Moral Eel, make sure you take into account this environmental need and create features such as large caves or crevices in which your eel can safely hide. Another good idea in planning hiding spaces for your eel, is to bury 2″ to 3″ PVC pipes in a few spaces in your aquarium. By making sure you prepare appropriate hiding spaces for your eel, you will make acclimation to your aquarium easier as they will be able to quickly and comfortably find spaces to feel protected and safe. Eels are carnivores and need to have a constant and varied diet of meaty food. Juvenile eels will need to be weaned off of live foods when they are first received so they will begin to accept dead or prepared foods. In general, it is better to use tongs to feed your eel! You do not way your fingers or hands to be anywhere close to the eel (especially the “fang-toothed” eels) when they are hungry. They have notoriously poor eyesight and have difficulty distinguishing between their meal and your hand. When you first receive your eel, start by feeding your eel with live food with your tongs or a feeding stick. This will acclimate the eel to receiving food from the tongs and then when you start switching the eel from live food to prepared food, it will be an easier transition for all involved. Eels will eat foods such as squid, shrimp, crabs, octopus, krill and silversides. Don’t be afraid to visit your local grocery store to get food for your eel. They enjoy variety and you can always buy food on sale and freeze it for future use. Eels are not like fish. Instead of scales, their body is covered by a thick mucus that protects their body from infections and parasites. Unfortunately, the mucus does not provide the protection that scales due making the eel very sensitive to medications. In general, medications should never be used in an aquarium with an eel. Eels are also very sensitive to poor water quality. If you notice your eel is not acting normal, the first thing you should check is your water. Regular water changes and the constant use of filter media will make sure your eel stays healthy. In general, you should only have one eel in your aquarium. It is possible to have more than one eel, but you would need to make sure your system is large enough and have multiple locations in different areas of the aquarium for the eels to claim and protect. Since adult eels are territorial, it is very important that multiple eels be introduced to an aquarium at the same time. If you are lucky enough to successfully raise two adult eels and one happens to die, you will need to wait until the other eel dies before you introduce a new eel to your system. 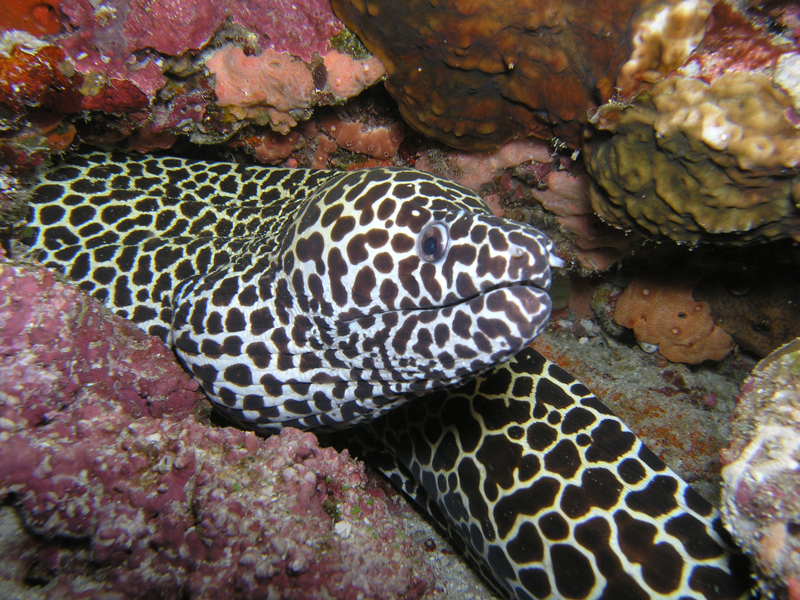 Eels are also very clumsy and will often rearrange rocks and corals when they move around. Be sure you plan accordingly if you plan on also having corals in your aquarium. You will need to secure rocks with glue or epoxy if you do not wish to have your aquarium redecorated by your eel. Garden Eels are very interesting animals and usually captivate anyone who comes in contact with them. The way they gently sway back and forth in the water current can almost be hypnotic and owners usually find they are very relaxing to watch. Their mesmerizing nature makes them a highly desired eel, but unfortunately many people fail miserably when they first attempt to introduce these eels to their aquarium simply due to lack of research. Garden Eels are not particularly difficult to keep, but you do need to make sure you provide a proper environment for them as well as an appropriate food source. Unlike their Moray Eel cousins, these gentle carnivores prefer to live in groups of at least three and require large areas of open sand. The number of eels you can keep really depends on the size of your set up if you plan on having a species only aquarium or a mixed reef. Most people find success with a colony of 6 – 10 eels in a standard 120 – 180 gallon aquarium. When setting up your system, you will need to make sure you have at least 1 square foot of open sandy substrate per Garden eel pair. This space allocated needs to be continuous since the eels mimic each other in daily behavior. Ideally the set up needs to be at least 24″ in height and at least 24″ from front to back. Cube set ups will also work for Garden eel colonies but will require at least four feet of surface area. Keep in mind that the larger the set up, the more you can plan for your eels and still have room to aquascape for the presentation of your corals. While it is possible to house fewer eels in a smaller set up, the frequency of feedings and large amount of food constantly in the water column can quickly turn into a nightmare for nano hobbyist. It is recommended that only highly experienced aquarist keep Garden eels in a nano aquarium. Since Garden eels are burrowing animals, having an appropriate sand bed is essential. Most articles recommend at least 8″ of sand for the eels. This recommendation comes from the fact that the eels typically reach a length of 16″ and usually keep at least half of their bodies buried at all times. In captivity however, the eels usually do not exceed 11″ so if you plan on having a sand bed closer to around 10-12″” your eel would have ample room to fully retract if it is frightened. If the eel does not have ample room to retract vertically, it will burrow parallel to the glass bottom as needed. Be sure to use a fine grade sand for the majority of the sand bed, topping it with 1/2″ or more of coarse sand or crushed coral at the top to prevent the soft sand from blowing around your tank. Once acclimated to an aquarium, Garden eels have been known to accept a large variety of prepared food. Juvenile eels will usually only accept live brine shrimp and upon acclimation will need to be weaned off the live diet by slowly mixing prepared foods with live foods over a period of a few weeks. Garden eels usually eat Zooplankton, Fish and Oyster eggs, Copepods, Mysis Shrimp and Cyclops. The trick in feeding the Garden eels is the delivery. If you add too much at one time, you will destroy your water quality. Delivery too little and the eels will die. Target feeding is not an option since they are notoriously skidding and to make matter more complicated, they will not leave the sand bed to retrieve food. Feeding Garden eels requires a great deal of patience, especially in the beginning. You will need to deliver food via a gentle water current that will allow the eels to pick the food out of the water column without leaving their sand bed. In order to make sure the eels consume enough food, you need to plan on feeding the eels a few times a day. 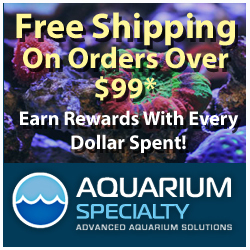 This process will unfortunately provide a large amount of waste in your aquarium and a strict maintenance schedule is an absolute requirement. As discussed, most of the special needs of the Garden eels revolve around their environment and feeding. Keeping these animals is not for the new aquarist and successful care revolves around consistent and diligent care. If you are planning on keeping a colony of eels in a mixed reef there is really very little you need to do to protect your corals or invertebrates. They are considered to be “reef safe” but to be successful with their environmental needs, aquascaping will look very different in an eel aquarium than it would in your typical mixed reef set up and they will require a deep sandbed. Since Garden eels are shy, non aggressive eels, they will easily retreat into their burrow if they feel at all threatened. This will cause problems with feeding, so it is highly recommended that if you are planning on keeping Garden eels that you only have small, peaceful fish in the aquarium. Larger, more aggressive fish such as tangs and angelfish will constantly terrorize the eels making it almost impossible for them to receive the food they require from the water column. When introducing Garden eels into your system, be patient. They usually will take a bit of time to find their preferred spot in the aquarium and due to their disorientation in the early stages of acclimation often will end up in the overflow or sump. To prevent them from ending up where they shouldn’t be in your system, make sure you take precautions such as guarding your overflow. Also make sure you don’t panic if you can’t find your eel for a few days. In the early stages, the eels often fully bury themselves in the sand and are just too scared to leave the safety of their burrow. The best recommendation we can give you if you are interested in Garden or Moray eels is to make sure you do your research and take it slow. Eels require quite a bit of care and consideration and should never been an “impulse” buy.